Oolong is one of the most beloved teas in the world. Here at Sir Jason Winters, we have several tea blends which include the goodness of oolong tea. So what’s so special about this particular tea? Oolong is semi-fermented. Its blue-green leaves can have a reddish edge on the leaves, and it has a wonderful and unique aroma. It is an actual tea like green or black tea and comes from the tea plant known as Camellia sinensis. More than 1200 years ago during the Tang Dynasty, Chinese Tea Master, Lu Yu, described oolong tea as having twisted leaves that were “curly like mist climbing a ravine.” The name of this tea means “black dragon” dates back to the great Dynasties of China. Legend has it that it has the tendency to take the positions of dragons within the teapot when it is brewed. Most oolong tea that is available on the market comes mainly from Mainland China and Taiwan and makes up just 2% of the tea that is consumed around the world every year. 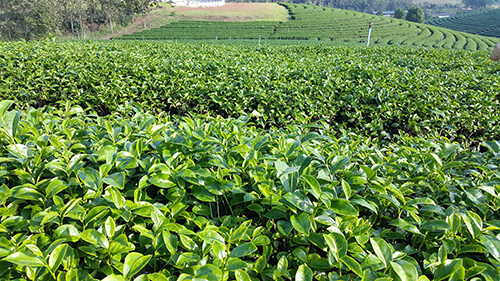 In the mountains where it is grown, the leaves undergo a slight fermentation so that it ends up somewhere between green tea and black tea in flavor. If you have tried our original Sir Jason Winters tea flavors, then you have already enjoyed one form of oolong tea. Oolong is the type of tea we use in the blends along with the other components like red clover, chaparral, sage, and our special ingredient Herbalene. If you haven’t been able to place the tea flavor in our blends, you might want to give some plain oolong a try and see if that’s the flavor you’ve been missing. The variation of the oolong tea plant, the region where the tea is grown, and the method of processing the tea can all have an effect on both its flavor and aroma. Some oolong tea varieties are described as being creamy and smooth, while others are honey sweet or fruity and still others are full-bodied and have a flavor similar to roasted coffee. The processing and region can also have an effect on the amount of caffeine found within the oolong. The leaves of high-quality oolong tea are able to be steeped several times and according to some traditional sources and not losing any of its pleasant scent or taste. Much of this is because oolong tea is high in antioxidants like bioflavonoids. Add to this quercetin, which is an antioxidant that plays an essential role in fighting the damage done by free radicals within the body. Quercetin has also shown anti-inflammatory, anti-viral, anti-microbial, properties and is anti-allergenic. Over the years there has been an extensive study into the health benefits of both green and black teas. In January, major health news was released from Saint Louis University in St. Louis, Missouri regarding Oolong Tea and its potential for affecting breast health. 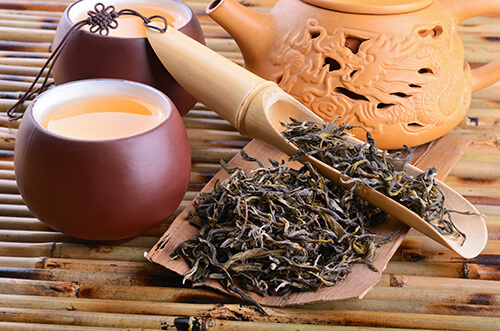 The team of researchers made up of collaborating scientists from China and the U.S. and led by Dr. Chunfa Huang, Ph.D., found that those who consumed oolong tea and Oolong tea extracts regularly reduced incidences of breast cancer and other types of tumors. Further, the research showed in tests conducted in China, the United States, and Singapore that it demonstrated definite inhibitive effects of tea catechins and epigallocatechin gallate (EGCG) on breast cancer. The oolong tea was reported to have damaged the DNA to all six lines of breast cancer when treated with oolong tea extract while normal cells within the body showed no damage. There was little to no recorded damage to any of the lines of cancer cells from either black or dark teas. The research team also examined data from 2014 from the Chinese and Fujian province cancer registries. What they found was that both breast cancer deaths and the incidence of new cases of breast cancer were 25% lower in those who consumed more significant amounts of oolong. Additionally, the rate of breast cancer within those who drank more oolong tea was found to be 50-68% lower than the national average of reported breast cancer cases. As you can see, there are potential health benefits to drinking oolong tea. This excellent, ancient tea variety is delicious on its own with no sweetener, or you can add stevia or raw honey to taste. You can enjoy a hot cup of oolong tea any time of day to warm you up or cool down in the summertime with a refreshing glass of iced oolong tea. If you love the spicy taste of chai, use oolong tea in place of black or green tea for a flavor that is both exotic and loaded with health benefits. And as we mentioned, you can enjoy the flavor of oolong tea by drinking any of our original Sir Jason Winters blends. Bebermeyer, Carrie. “Can Drinking Oolong Tea Help Prevent Breast Cancer?” Saint Louis University: SLU. N.p., 17 Jan. 2019. Web. 26 Feb. 2019. “Oolong Tea Extracts Help Combat Breast Cancer.” N.p., 29 Jan. 2019. Web. Chalmers Health Reporter For Mailonline, Vanessa. “Oolong Tea Extract May Fight Breast Cancer as Scientists Claim It Has ‘great Potential.’” Daily Mail Online. Xiang, Li-Ping, Ao Wang, Jian-Hui Ye, and Et. Al. “Suppressive Effects of Tea Catechins on Breast Cancer..” Docksci.com. DOCKSCI.COM, 28 July 2016. Web. Feb. 2019.